Overnight trade has not been kind to the US equity markets with the S&P 500 set to open down over half a percent and near session lows. Rates are at session lows as well with the US 10-year yield down for the third session running, while US credit spreads are widening out having made new lows for the current move tighter in spreads since January over the past week. In energy markets, WTI is down over 1%. EM assets generally overnight were weak, down almost 1% thanks to global risk asset weakness. Data today includes initial claims and consumer credit from the Federal Reserve on an otherwise quiet day. Scheduled Fed speakers today include Kaplan (Dallas, 9:15), Clarida (Vice-Chair, 9:30), and Bullard (St. Louis, 7:30 PM). A week ago yesterday, the FOMC surprised markets with an even more dovish than expected policy announcement. 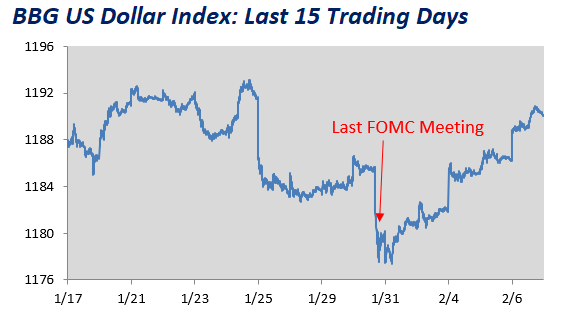 One would normally expect the dollar to sell-off following a more dovish than expected FOMC, and while we saw a sharp decline in the dollar on the day of the FOMC meeting, since then it has traded higher every single day. With today’s early strength, the index is on pace for its sixth straight day of gains and is now well above levels it was trading at before last week’s FOMC meeting. The dollar has been strong over the last week, but from a longer-term perspective, it still remains in a downtrend. 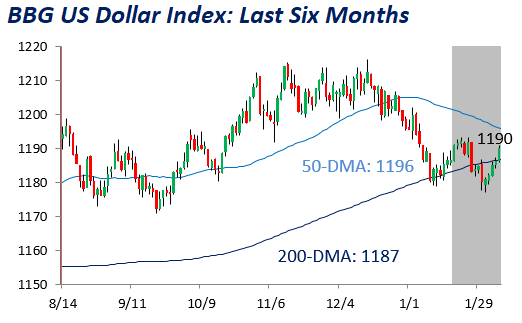 Yesterday’s bounce brought the Bloomberg US Dollar Index back above its 200-DMA, but it still has yet to break above resistance just under 1,200 at its 50-DMA. So, keep an eye on that level as a sustained rally in the dollar after last week’s Fed pivot would be quite a surprise for financial markets.